Dear students, to pave your way to ace the grades in General Awareness Section of banking and other competitive exams, Adda247 is providing you current affairs one-liners of March 2019 for LIC AAO, ESIC UDC & Stenographer, National Housing Bank Assistant Manager and other competitive Exams. 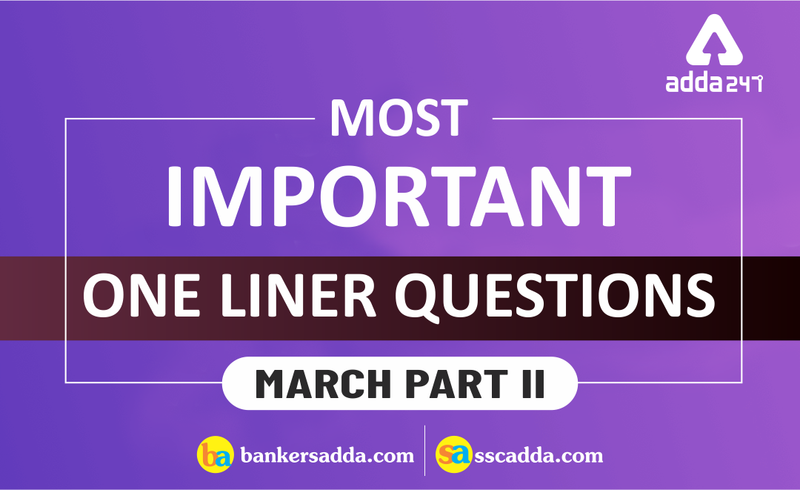 Here you can download the Part-II FREE PDF of Current Affairs One-Liner that provides day-wise questions on Current happenings, Static and Banking Awareness of March 2019. You all must be pacing up your preparation for LIC AAO, ESIC UDC & Stenographer, National Housing Bank Assistant Manager Exam. To help you up in this Bankersadda is coming up with free PDF in the form of One-Liner Current Affairs that covers News events from 1st March to 15th March. We are all cognizant of the fact that current affairs play a significant role in the General Awareness Section of Banking/Insurance/SSC/Railways examinations.